"...At South Coast Rep, the gravitas of the final scene — in which, the Playwright returns to interview his now elderly father about his wartime experiences — was delivered almost as a coup. The ending is more organically reached in this East West Players production. A faint trail of tears — the audiences’ even more than the characters’ — guides the journey toward this reckoning between survivor father and artist son, a conclusion that daringly keeps an open mind about America’s controversial role in the Vietnam War." 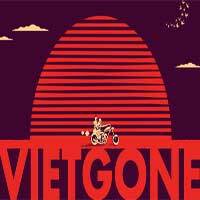 "...VIETGONE should play well with the younger audience demographic, as Nguyen skews younger with plenty of street slang, cussing and rapping from his Vietnamese characters." "...The writing is super solid, as are Kaitlyn Pietras and Jason H. Thompson’s sets and projection, but the production is shakily recommended because it almost works too hard to unearth the play’s universal core and loopy gifts. But it certainly finds gold amidst the ore, such as the touching scene when the playwright’s father, Quang, urges his son to understand that he’s neither Asian nor American — he’s Vietnamese — a gut-punching assessment that augments the conversation about immigration in the world right now." "...Romantic comedy lovers are in for a treat as couple of Vietnamese evacuees in an Arkansas refugee camp circa 1975 fall reluctantly in love in Qui Nguyen’s Vietgone, one of East West Players’ all-around best productions in years." "...Otherwise, this play is a very impressive achievement, and the current production at East West Players does it full justice."